Border Police officer thwarted an attempted stabbing attack at the Me’oras Hamachpela this morning when a resident of Chevron tried to enter theMe’oras Hamachpela with a knife in his possession. 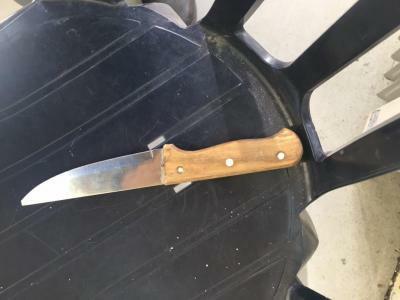 Border Police officer thwarted an attempted stabbing attack at the Me'oras Hamachpela this morning when a resident of Chevron tried to enter the Me'oras Hamachpela with a knife in his possession. The police noticed from the suspect’s behavior that he was not connected to the group and called him aside for a more thorough inspection. When the suspicion grew stronger, the soldiers aimed their weapons and at this point the suspect pulled the knife out from his clothes, and threw it to the floor and gave up. Initial questioning revealed that this was indeed a person who apparently came to carry out a stabbing attack there.